Since 2015 we have provided 2 days a week support to Allens Cross Community Association to deliver a community growing space for the Trescott housing estate. The Association had no experience of running a community garden. Our support and training sessions included volunteer management and community engagement, site design & management, supervision of construction, volunteer management; delivery of education sessions, assistance with production, distribution and marketing of food. The beneficiaries of the garden currently include individuals experiencing a range of social and health disadvantages including with mental health problems, learning disability, NEET. We regularly have members of the community, children, corporate groups (CSR) attending our work days and education sessions. The Garden now has a bee-education facility for children. In 2017 it has received a Britain in Bloom Outstanding Award. Thanks to the educational support provided by the Ecocentre, the garden currently enjoys an increased number of volunteers (18 volunteers per session during the growing season and a total of 1840 volunteer hours over 2016). They gained skills about growing systems and techniques, improving yield and understanding nutritional value of food. They also considered the use of recyclable materials and composting to reduce costs and improve yield. In 2017 we harvested 185kg of fruit and veg from the garden. This is equivalent to 2,313 meals or £1,109.34. Just think what you could do with your community group. “There is no doubt that a large part of the project’s success is due to the Ecocentre’s knowledge, enthusiasm and experience. The involvement of the Ecocentre ensured that the project got off to a flying start from day one. It has proved to be a great success that is valued by local residents and users alike.” – Project Manager, Allens Cross Community Association. “They’ve transformed a disused piece of land. The wasteland, once known for its problems with antisocial behaviour, now has a positive. 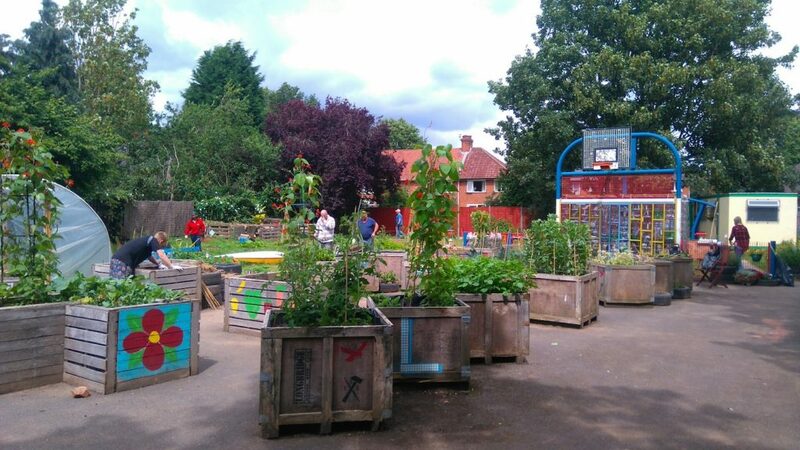 It is amazing to think that, through something as simple as gardening, other communities could do the same taking ownership of shared spaces and making them a place for people to come together.” – Previous Funder. “When my autistic boy was on a reduced timetable at school, Ecocentre staff gave him their time to enjoy gardening and outdoor educational activities. He was very low in self-esteem and feeling rejected, this help was significant in building up his confidence, letting him access learning activities at his level. His anxiety reduced in the garden. It had a really positive impact on him.” – Parent of participant. If you’re interested in getting involved in this particular garden contact them via their site here. If you would like our help to get your project started contact jackie@ecobirmingham.com or explore our Power2Grow project here.